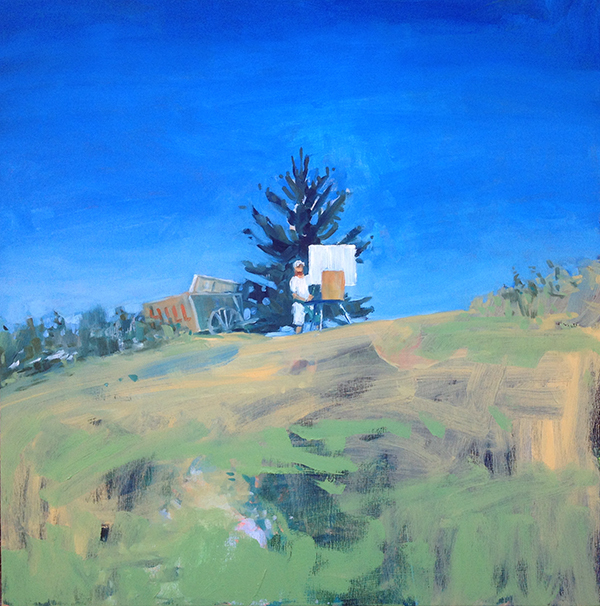 Last week I submitted my application for the 2015 Monhegan Artist's Residency. 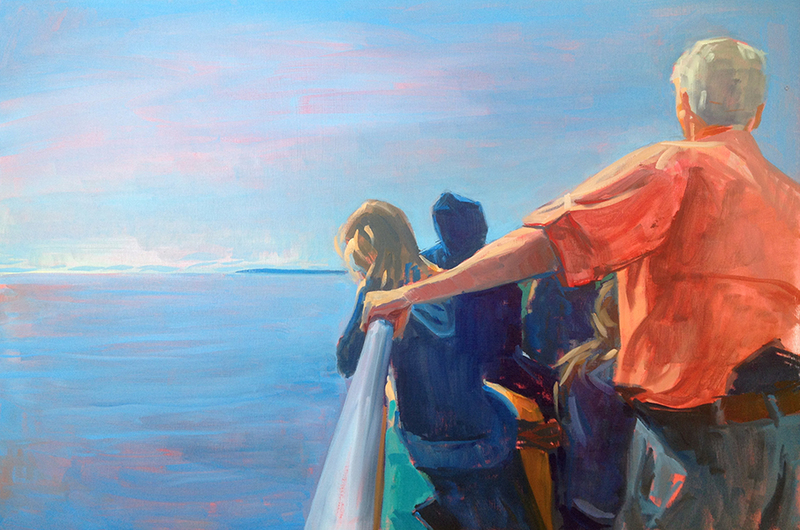 This past winter I've been busy painting from the experience and memory of last summer's island trips -- the ferry ride over, day trippers in awe at Whitehead, and the island's population of plein air painters in action. I'll continue to paint Monhegan this coming summer no matter what, but the residency would provide me with an opportunity to spend the night on the island for the first time and better capture the full spectrum of its light and life. Right now I'm limited to the Hardy Boat's 10:00am arrival and 3:15pm departure! Pictured here are five paintings I submitted with my residency application. All are oil on panel and range from 6" x 6" (top) to 20" x 48" (second from bottom). All have been completed in the new year and are not yet on my website. Please email me with any inquiries. I've also included my short application statement below. For those who are interested, I hope it provides context for the work that I do -- and will continue to do! "Always be on the lookout for the presence of wonder." During the past two years I have made paintings of Monhegan. In this application and on my website you will notice their glaring similarity: all depict the island drenched in mid-day light. Why? My visits to Monhegan have always been limited to the Hardy Boat’s 10am arrival and 3:15pm departure. My husband captains this ferry. We are always traveling to and from the island, never staying. But presence is what I desire. Picture me, sprinting across the island the moment the Hardy Boat docks, huffing up the hill, covering the terrain of trail 7 as quickly as possible, and clambering just below the edge of Whitehead to hurriedly set up for my shot before any other day-trippers arrive. Admittedly, the adrenaline and adventure of the rushed visual experience is typical, even attractive in our ADD culture; but it is ultimately draining and incongruous to my own practice of painting and being. Instead of being in a rush I want to take time to wonder. I want to be in a place. I want to already be at Whitehead, present and waiting, watching as the first visitors appear over the edge, pointing and shading their eyes from the expansive Atlantic before them. I want to witness their wonder. I want to wonder at their wonder. And wonder is hard pressed to rush. Wonder is important to me. I have an entire blog devoted to it. Like the content of themaineblog.com, my paintings are about being in a place of wonder. My recent “outsiders” depict figures hiking, swimming, climbing, and being in a place through sustained, physical exploration. Wonder drives me to action; what is it to know a place not only through the eye but through the body as well, and then to show this place by releasing it back through the body and into paint, for the full circle wonder of the eye? My earlier window paintings shattered into my recent outsiders when I finally acted on the desire to be out there, beyond the window panes. 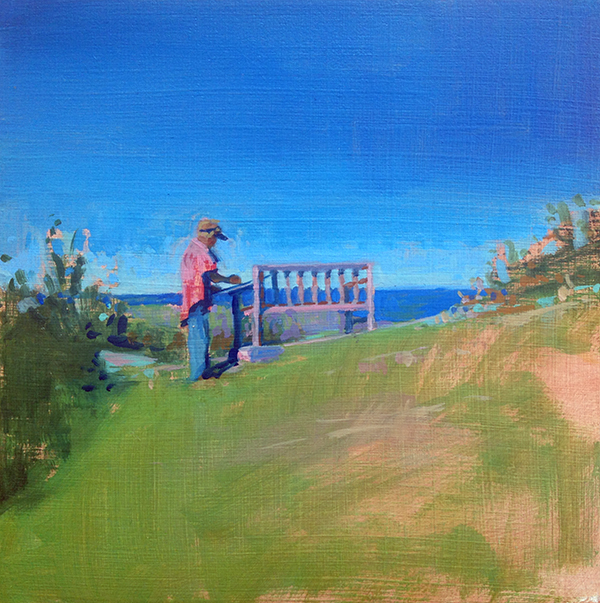 Likewise, my Monhegan paintings express a desire to be out there, there now meaning Monhegan. I desire a sustained and physical exploration of place. I no longer want to come and go in a five hour window when all the light is high and all the community is noisy and bright. I no longer want to be in my mainland studio contemplating the photos I’ve taken of other artists working and learning on the island. I want to be there, less noisy and bright myself, to wonder and to know what the light, the colors, and the people are like in the morning when I wake, in the evening before I sleep, and in the middle of the night while I’m dreaming. I want to be there and to follow E.B. White’s admonition — “always” — at least for a month.